Rising from the ashes of Friday and Saturday’s Lovebox Festival, Sunday saw Victoria Park become home to Citadel. Perhaps with a different ilk of people in attendance, one can presume, on first impressions – and reaffirmed throughout the day – the event manages to capture the harmonious atmosphere possessed by the best festivals seamlessly. 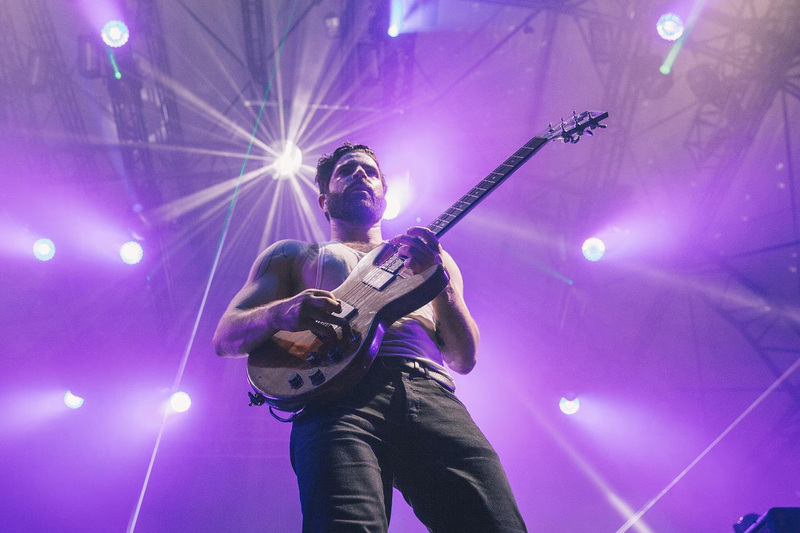 Looking, and more importantly, sounding the part with a tectonic light show complementing the anthemic nature of their back catalogue, the main attraction for many seemed to be Foals. The Oxford quintet step up to the plate by blazing through an atmospheric set which sees the group shake off their infantile namesake and evolve into sonic stallions at the forefront of 2017 festival headliners. The career spanning performance sees all of the usual suspects, such as ‘My Number’ and ‘What Went Down’ make an appearance in the set list, but it’s tracks like ‘Electric Bloom’ and ‘Red Socks Pugie’ that ooze so much more passion and vigour than the ‘Antidotes’ studio versions which electrifyingly cements the band’s worth as headliners. It’s the climax of a truly eclectic day which sees Bonobo mesmerise Victoria Park prior to Foals. As Simon Green’s intricate electronic productions echo around the site it’s easy to find yourself getting lost in the elaborate arrangement of ‘Cirrus’ or the pulsing ‘Know You’ drum beat. Wild Beasts also dominate Citadel’s main stage with their rendition of ‘All The King’s Men’ still sounding refreshing all these years on. Magical Maggie Rogers takes her main stage gig in her stride too. With her stage presence as enchanting as ever she demonstrates how to command the attention of thousands with just one beautiful voice. A production whizz too, there appears to be no end to Maggie’s talents as she endears the crowd further chatting in between songs and jumping down to dance with the front row during ‘On + Off’. Bellowing out of the Jägerhaus is the unmistakeable vocal of Willie J Healey. Gearing up to release his debut album ‘People and Their Dogs’, the singer performs the title track showcasing the retro lilt in his voice and slacker-esque guitars that were made to soundtrack hazy summer days spent lounging around in fields like this. Taking to Clash’s very own stage, The Kasbah, Jake Isaac and his band radiate blissful folk with a soulful touch courtesy of Jake’s vocal. Also throughout the day Leeds’ Vessels display another achingly captivating Citadel performance that rushes with an abundance of sonic elements to take in. Joining the plethora of Communion signings taking to the label’s very own stage, London trio Banfi settle into a mid-afternoon slot perfectly. ‘Happy As You Go’ breezes around the tent while ‘Rosedale House’ surges as they showcase their heavier sensibilities. Later in the day Twin Peaks make the transatlantic journey from Chicago to play a riotous and ramshackle show that transcends the rock, grunge and slacker genres. ‘Wanted You’ wallows like a moody teenager and juxtaposes itself next to the deliciously distorted and upbeat ‘Strawberry Smoothie’ at the end of their set.